Pelosi: Capitol Police working to ‘safeguard’ Omar after Trump 9/11 tweet An aide said that “there has been an increase in threats” against the Minnesota Democrat after the president’s post. Speaker Nancy Pelosi said on Sunday that the U.S. Capitol Police and the House sergeant-at-arms “are conducting a security assessment to safeguard Congresswoman [Ilhan] Omar, her family and her staff” after a tweet by President Donald Trump. Trump on Friday shared an edited video of Omar superimposed over images of the 9/11 terrorist attacks. “We will never forget,” the president wrote on Twitter. Trump’s tweet followed remarks by the Minnesota Democrat that seemed to play down the attack. Republicans and conservatives commentators lashed out at Omar over the incident. Pelosi’s announcement highlighted what has become an extraordinary situation — the speaker of the House is worried about the safety of one of her members after a statement by the president of the United States. An Omar aide said on Sunday that “there has been an increase in threats” against the Minnesota Democrat after Trump’s tweet. Omar’s office reports such threats to the FBI and Capitol Police, the aide said. A New York man who supports Trump was arrested two weeks after threatening to shoot Omar. And last month, a bomb threat was called in to a Los Angeles building where Omar was scheduled to make a speech. That address went ahead as planned. During the last decade, two members of Congress — Democrat Gabrielle Giffords or Arizona and Republican Steve Scalise of Louisiana — have been seriously wounded in shootings. Sen. Marco Rubio (R-Fla.) received death threats from a Venezuelan lawmaker in 2017, and security was stepped up around him. 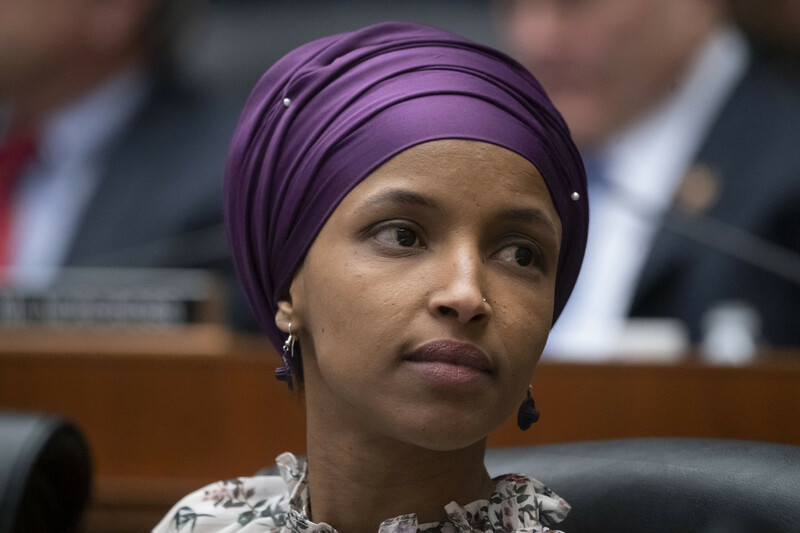 Omar, a Somali-American and one of the first two Muslim women elected to Congress, has become a center of national controversy over comments that have been condemned as anti-Semitic. The House has twice passed resolutions rejecting anti-Semitism and hate speech more broadly following those episodes. This latest incident began on March 24 when Omar gave a speech to the Muslim Civil Rights Organization, a week after the Christchurch massacre in New Zealand. An alleged white supremacist killed 50 Muslims in a mosque in that mass shooting. Three weeks later, on April 9, Rep. Dan Crenshaw (R-Texas), a Navy Seal who lost his right eye during an explosion while deployed in Afghanistan, criticized Omar’s comments, a move that set off a firestorm on the right — especially on Fox News — and eventually led to Trump’s intervention. Omar and her defenders, including Rep. Alexandria Ocasio-Cortez (D-N.Y.), immediately shot back, saying that comments like Crenshaw’s — and, later, the president’s tweet — were endangering the Minnesota Democrat, who has faced a litany of death threats since coming to Congress. “We are getting to the level where this is an incitement of violence against progressive women of color,” Ocasio-Cortez told reporters on Thursday. But Crenshaw didn’t back down, issuing another defiant response on Friday, hours after Trump’s controversial tweet prompted further outcry from Democrats. Not all Democratic criticism was directed across the aisle, however. Rep. Rashida Tlaib (D-Mich.), another high-profile freshman and an ally of Omar and Ocasio-Cortez, directed her complaints at Democratic leadership. “They put us in photos when they want to show our party is diverse,” Tlaib said Saturday, responding to a tweet about how top Democrats hadn’t done enough to defend Omar. Pelosi, who is currently traveling overseas, had largely avoided wading into the latest controversy surrounding Omar until her statement Sunday.